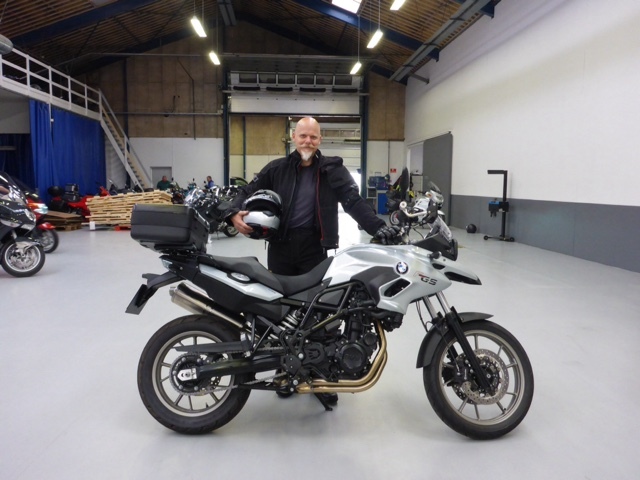 Today I took delivery of my new BMW F700GS from Xpedit my new BMW dealer here in Denmark. It has actually been sitting at the dealer for ten days fully paid up and proud whilst I waited for my residency number (CPR number) to come through so it could be registered. By the way this was also my second attempt to pic it up as two days earlier we drove out (2hr return) to pick it up only to be faced with driving rain that did not let up. So we had to retreat back to Kolding to regroup. The dealer was kind enough to let me take my new Schubert C3 pro helmet, Rukka gloves, jacket, trousers, Dayton boots, inner bag for the BMW top box all on account to pay him when my transfer comes through. Plus he gave me a great discount. Thanks Rune.